Contains one of each: Padron Anniversario 1964 Exclusivo Maduro, Padron 2000 Maduro, Padron 3000 Maduro, Padron 4000 Maduro, Padron 5000 Maduro. Very fine quality cigars sealed in a pouch with a Boveda inside and securely boxed ensures these cigars arrive in pristine condition. Great Padron sampler. Taste, draw and burn were well worth the price! Will purchase again. 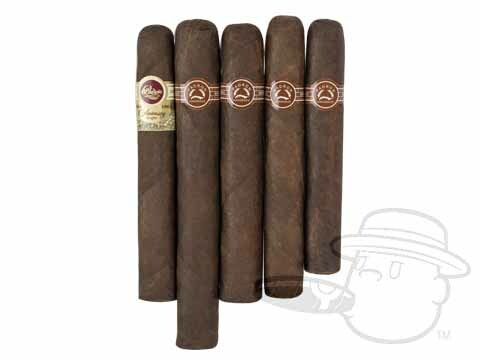 Padron Sampler #88 Maduro is rated 4.9 out of 5 based on 4 customer ratings. Thank you for your question. Sorry for the delay in responding to your question. In most instances you can typically order cigars in advance and not have any issues with them. We do however recommend that if they have been out of a humidor for an extended amount of time, that you place them in a humidor for 7 to 14 days to refresh them. This will make sure that you can enjoy your cigars at their optimal levels. I hope that this has answered your question to your satisfaction.